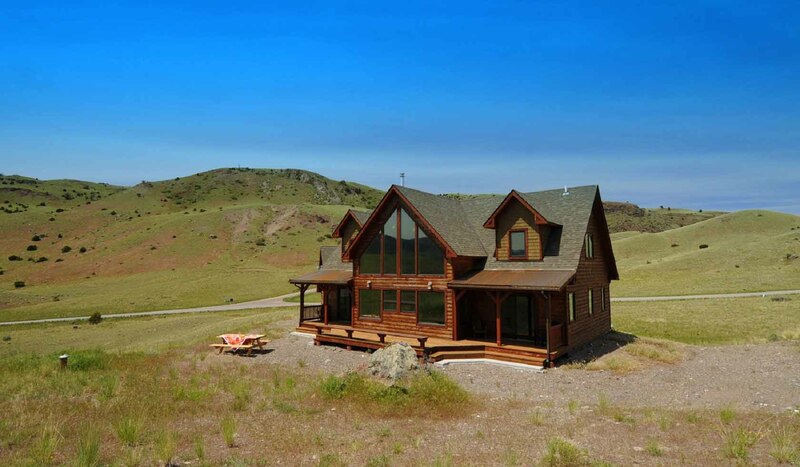 Brand new log lodge with incredible mountain views toward Yellowstone National Park. The home sits on 5 private acres on a sunny hillside above the Paradise Valley. Arcturus Lodge has WiFi for your convenience. Brief Description: The owner of this home has done an exceptional job of furnishing and appointing the home to be comfortable and welcoming. This pretty log lodge enjoys a hillside location in the heart of the Paradise Valley, giving visitors easy access to Yellowstone National Park, the Yellowstone River, Chico Hot Springs, and area activities. It's beautifully decorated and has great views, making it a super place to return to after a day of exploration. Bedrooms and baths: The lodge has three bedrooms and two and a half baths. The master bedroom on the main floor has a beautiful king size bed, a private bath with a large shower, a walk-in closet, 48" TV, and sliding doors that open to the amazing mountain views. Also on the main level, just off the living room, is a guest half bath. Upstairs there are two more bedrooms, each with a queen size bed and sitting area. There is also an open loft reading area with a sofa that opens into a double bed. Upstairs there is one full bath with a tub shower. Kitchen: A real chef's kitchen awaits you! It's stocked with all the tools you'll need for a great stay, including very nice new appliances. There is a five burner commercial gas stove, standard kitchen appliances like a dishwasher and microwave, as well as lots of extras including hand mixers, a blender and a crock pot. There is a nice bar counter for chatting with the cook, and the open dining area is just off to the side. The kitchen also has a large walk-in pantry for easy storage of your weeks groceries. There is a gas barbecue for your outdoor grilling. Dining area: A dining table right off the kitchen will seat eight comfortably, and there are two seats at the bar for overflow. The dining area has a sliding door that opens to the back deck with a picnic table for your outdoor meals and a set of four Adirondack chairs for cocktail hour. The north side porch has a bistro set for enjoying morning coffee and a good book. Living room: The cathedral ceilinged great room has huge windows looking out to the south on the beautiful mountain and Paradise Valley views. There is comfortable leather furniture, a wood stove to gather around after a day's outing, and a 55' HD TV with surround sound, DVD player and satellite service. Enjoy a great selection of games for fun in the evenings. Loft: The loft overlooking the great room has a sitting area and book case with a nice selection of local titles. The futon couch folds out to become a double bed for additional guests. To give you a bit more flexibility on sleeping arrangements we also have a few inflatable mattresses for children. Setting, acreage, and views: Arcturus Lodge sits on five acres on a private, sunny hillside above the beautiful Paradise Valley. You have incredible views both up to the high mountain peaks of the Absaroka and Gallatin Mountains, and down to the winding Yellowstone River. Activities nearby: Fish on the nearby Yellowstone River, go horseback riding, rafting, hiking, or mountain biking. Chico Hot Springs is just 15 minutes away, the artsy town of Livingston is 30 minutes north, and the funky downtown of Emigrant with a great saloon is just 5 minutes away. Be sure to make time for an outstanding private tour of Yellowstone National park with our sister company, Greater Yellowstone Guides. Closest town and airport: You are just 5 minutes away from the Emigrant General Store for groceries and about an hour away from Bozeman's Gallatin Field Airport.